Welcome to Day 17! If you’re just joining us, you can find the previous posts up under the 31 Days tab. After yesterday’s two posts I am finally all caught up as well. It’s nice to be back on track. I thought we could continue on with the Kitchen Binder today. I’m currently working on my Inventories section and I thought it might be nice to share how I see that working. So today we’re going to talk about knowing your kitchen staples. I can’t believe we’re more than halfway through October now. The leaves are starting to change, the weather is cooling down and I’m slowly seriously thinking it’s time to break out the hot cocoa recipes and pick up some of hot-chocolate mix and marshmallows. That last thought made me thinking about the items that typically find their way to my grocery list. Some are year-round items, and others are a little more seasonal, but, for the most part, these are items I always keep on hand, my staples if you will. The more I thought about our staples, the more I realized there is a whole area to the kitchen (a partially figurative area) that I’ve overlooked for a long time. Why is knowing your staples important to kitchen organizing? Well, think about it this way. Outside of housing, food costs are some of the highest bills we pay. So many people are constantly on the look out for how to save money, and the grocery bill is a good place to start. Knowing what you normally have stocked in your kitchen or what you normally use can help you plan your shopping trips. It means you know what to buy in large quantity or bulk packs and what to purchase as singles. Knowing your staples means you can adjust your meal planning for one week, for two weeks, for a month, and have a backup plan for nights you just don’t feel like eating what you planned on. Over time, knowing your staples, and the amounts you use them in can help you plan how to store and organize them. When canisters or other food storage containers come on sale at your favorite home goods store, you can purchase them guilt free knowing they will get used. Or maybe they’re not on sale, but you know they will be a perfect fit for x, y, and/or z. Again, it’s a guilt-free purchase. Not only that, but you lower the risk of making purchases that end up being clutter. So how do you know what is a staple and what isn’t? First, let me say, each and every household will have a different list. Sure some items may be the same, but others will differ vastly, so there are no right or wrong answers here. To figure out what your staples are, think about any food or beverage items you use every day or fairly often. Things like coffee, tea, sugar, milk, cream … items you use more than once a week could safely be considered staples. Think breakfast, lunch and snacks for this part. Now think about the meals you make or the recipes you use. Are there common ingredients? Especially the non-perishable or dry ingredients? Add those items to your list. Do you do much baking? Flour, sugars (white and brown) baking soda and powder might be staple items for you then. What about those items are your must haves for different seasons? Hot chocolate in the winter? Apple cider in the autumn? And don’t stop at just the food items. Do you use a cleaning wand that has replaceable sponges? These could be considered staples as well. Write them down so you can see what kitchen staples you have. Don’t worry if your list is long or short, the point is that these are your must have, can’t function without, items. They are the base around which all meals and snacks are created. I just used a piece of lined paper for this, but you can use this handy little printable I made up if you want too. I think I’ll rewrite my own list. I intend to use this list when checking out the weekly flyers and coupons. 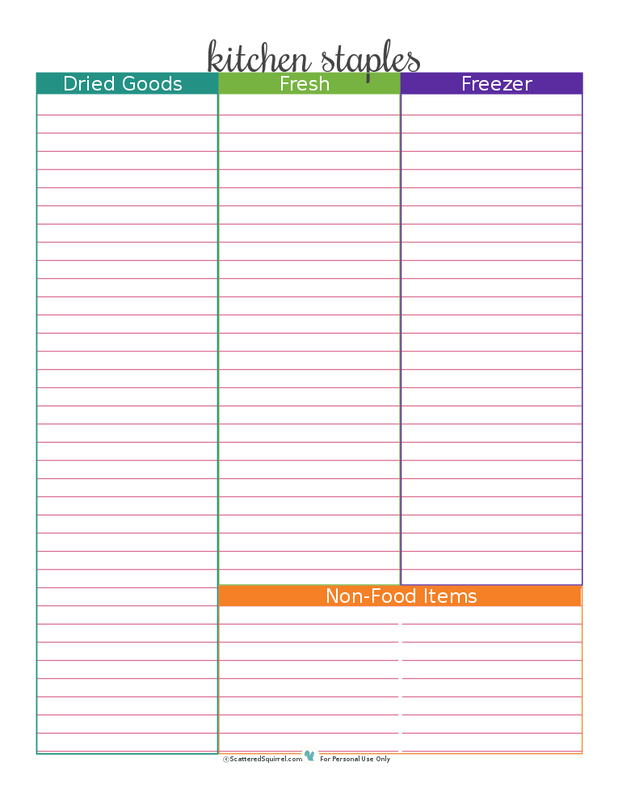 Combined with my Pantry Inventory sheet, I think it will go a long way to help stretch our dollar, and also to help ensure we never run out of the items we use the most. If this isn’t your cup of tea, that’s ok, you need to do what works best for you. Though you could always fill it out for someone else. Are there any young adults in your life who are getting ready to leave the nest? You could use this printable to make up a basic list of kitchen necessities for them. What’s one thing you couldn’t live without having in your kitchen? One item I can’t live without in the kitchen? COFFEE! Lol, I can technically LIVE without it, but I don’t FUNCTION well without it. 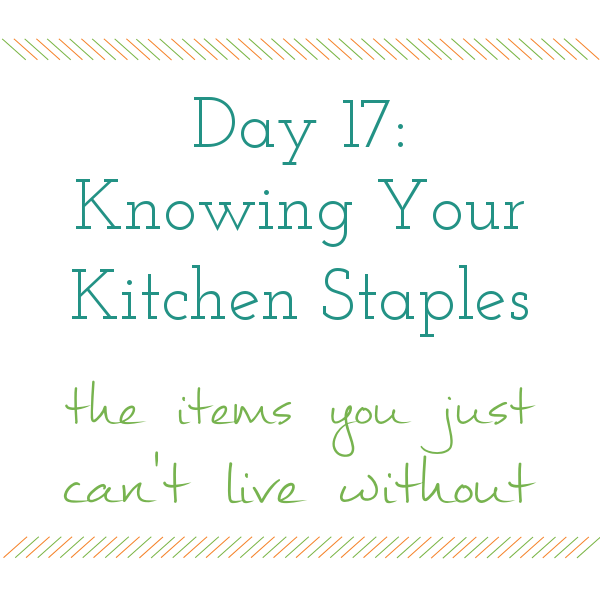 😉 I really like this idea of having a list of kitchen staples–I’ve toyed with the idea of making my own list and a system for marking each item as “OK,” “Low,” or “Out.” Maybe I’ll try your “X” and “/” and see if it works for me. Your printables are always so much prettier than I can make, anyway. Thanks, Alli! I am with you on that one Kristin, I need my coffee. My family needs me to have coffee too! lol You could always try using the “/” and “x” in a different way. “/” could mean low and “x” could mean out and an empty box means you’re ok? I don’t know if that would work for you or not. Thanks for the heads up Laura, I can’t believe I missed that. I’ll get it fixed right away.